Sometimes it can be hard to balance your work life with your personal life. Sometimes your work load is too much to handle and your personal life takes a back seat as a result. Sometimes, it’s because you’re not working enough, so your personal life will suffer. Perhaps you are working too many hours a day, or you’re not working enough hours a day. Other times, there are just not enough hours in a day to go to work, and go out for a drink afterwards. We have all probably had a moment where we threw caution to the wind and embraced the night – only to go to work the next morning feeling like a zombie. It’s time to balance your work with your personal life! It’s nice to spend a night out with friends, but we have to remember that work is important, and ultimately pays our bills. It’s important to do a good job at the work place, because at the end of the day, it ensures your future financial stability. Unfortunately, your personal life should take a back seat to your job, but it doesn’t mean that it needs to be banished all together! If you’re not working weekends, it’s the perfect time to hang out with friends, go out for drinks and stay up late if you want! That way, you won’t run the risk of causing trouble for yourself at your place of employment! There are plenty of ways to balance your personal and professional life, so that you get the best of both worlds! I have a pretty strict rule of not going out late on work nights. I take it easy, spend time with family, but I don’t get crazy partying until the wee hours of the morning. I value my job and want to be able to perform when I get in in the morning. Going out drinking on a Thursday night is no excuse for being late or cranky all day Friday. Something I find important for me in creating work life balance is that I keep work and my personal life as separate entities. I do not like going out for drinks with coworkers, especially since I have a position where I am often training many of them and I think it is best not to blur that line between supervisor and a work buddy. I stay away from those outings because once I am out of work I don’t want to be sitting around discussing work or seeing coworkers acting foolishly. If I want to go out for some fun I do so on Fridays or Saturdays with my close friends. It is good to leave the office at the office. All work and no play is not fun at all.. Be a responsible adult and know your limit. For me I need to prioritize life more than work. I go home thinking about work, I don’t take breaks, etc. I have noticed it is starting to get to me and I am feeling stressed and burnt out. I am slowly making an effort to improve my priorities and have a personal life as well and work on delegating some tasks that I don’t necessarily need to do. That cat looks pretty content! I think if I could bring my dog to work that would create the best work life balance! And she’d entertain my whole office. When I was younger–so much younger than today–I never needed my younger body to sleep much in any way. I could have a mischievous personal life and coukl sleep only four or five hours for a few nights in a row and not have it hurt my work performance. But, as an old codger, i need my seven hours a night in addition to the 1, 2 or even 2-1/2-hour nap I may take in the evening. All to be fresh and raring to go the next morning for work. I find that once you clock out of work you leave work there. I don’t get work emails on my phone and I don’t take work home with me. Only during our busiest period which is one month a year do I work at home. If you have a job that causes you to have to go out for drinks frequently during the week then perhaps there is a bigger problem and you need to look into a new job! I don’t think I’ve ever left work, even on a bad day, feeling like I had to go straight to the bar. At the end of the day, work is what will provide you the means to have a personal and social life. You can’t let the fun get in the way of what funds it. I just maintain a clear line between my personal and professional lives. From 9-5 I only focus on work, but once I’m out the door I stop checking e-mails and turn off that part of my brain. You can’t let the two mesh or else you lose focus and the distinction between the two. Balance in all areas of life is very important, but especially in your work and personal lives. Balance is important and can be tricky, but I go by working to live. The balance is crucial. Your work life provides for your personal life, yet you don’t want to work so much that you don’t have a personal life to enjoy after all the hard work! While you don’t want your work life to completely eliminate having a personal life, you need to focus on being professional and alert at work. Frequent late nights on the town will really set you back. 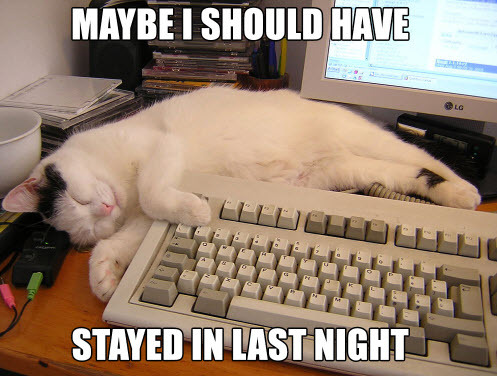 I made the mistake of partying too much during the week when I was young. My job performance and salary suffered because of it. Learned my lesson. Lately my personal life has been suffering. I kill myself all day at work that even if I get home early I am too tired and burnt out to do anything. I can’t seem to find the right balance and my work life always comes first for me. Forget the partying aspect of a personal life outside work. How do you balance a long & exhausting workday with family responsibilities and commitments to our kids’ social & sports activities? I’m a single dad, not a party animal. Most of my social life is the same as my friends and co-workers’. We eat out maybe once a month, maybe have a beer, and catch the subway home. It’s too expensive to party in NYC. Why waste your money on drinking? Spend it on a great vacation away from the city! If you’re out at a bar, looking for a date, then moderate drinking is the way to go. Never mind the work consequences the next day- how about the mistake of getting drunk and acting like a fool in front of Ms. or Mr. Right? I go out twice a month which is all I can afford. We have a few girls at work who like to go out to eat, have a drink & gripe about our jobs, the boss, etc. and it’s fun. We’re not big drinkers so that’s not a problem. Then I try to see my old college friends. We usually meet for burgers and talk about family, kids, church, etc. It’s all about balance. Just like when you were back in school, stay in week nights and go out weekends. But if it’s business during the week and your boss expects you to join in for drinks, my advice is to have one and then have soda after that. Getting teased for not having another? Answer: Gotta stay sharp for work tomorrow! Why is it ok to go out for drinks during the work week? Why not save a lot of money and go home after work? Designate one night only for after work fun and spend the savings on vacation. Amazingly, my frat brothers and I enjoy a very active social life without all the booze we consumed while in college. We’re still single, go to sports bars, etc. and make sure we stay sober. It’s called being a grown-up. It’s hard to meet ms. or Mr. Right if you’re single in a big, new city. Going out after work with co-workers usually means drinking. Just have a soda after the first alcoholic drink and enjoy the scene. I’m young, I want to go out and meet friends and make new friends. You pretty much have to go to bars to do this. Just have some self control with the drinking and what time you have to leave to get home. There’s no excuse for being late to work when you’ve made a night of it. Drag yourself out of bed. If you don’t do your job you might find yourself out of a job. Respect your employer. You’re getting a salary every week while millions of others don’t have a job. Simple respect, and doing the job you are getting paid to do. Keep that in mind. I’m a little sick of the bar scene but I don’t have any friends where I moved after college. I wanted this great job but it’s pretty lonely. I joined a gym now and met some people who would rather socialize there than at some bar. I feel blessed I’m back home after college and I have a good job just a short commute from here. I see my old high school crowd around town and never feel lonely. I’m sorry that some people have to move and feel lonely in a big city and feel they have to go out and drink all the time. Dave and Faith – I agree. I sure don’t want to see my coworkers sloshed and I definitely don’t want them to see me in that state too, especially since I supervise my team and have to train these people. I’d rather people think I am boring than try impressing people being drunk and wasting money on alcohol every week. There are much more interesting things I could be doing with my time. Faith is so right about this one. Maybe when we were all young and in college we could pull off partying on weeknights and still making it to class and work in the AM, but those days need to be left with college. There are bigger consequences once you are an adult in the working world and you can really destroy your reputation by hanging around the wrong people or getting wasted in front of coworkers you have to see everyday in serious meetings. I don’t know how anyone can go out and party after work. I’m so exhausted by the end of the day. I get in at 8:00 and don’t stop all day. I have no energy to even make dinner some evenings! I have no interest in the bar scene anymore. At 30 years old, I find it boring and a waste of money. I don’t see the appeal of getting drunk and feeling like garbage the next morning. And I certainly am not interested in meeting some overgrown frat boy at a bar. My focus is on my health and my career and saving money. I have bigger goals now than nursing a hangover the next morning. I’d rather spend the money on my gym membership where I can keep myself in shape and meet other people with those same goals. My days of drinking were left in college. Some things are best left in the past. Call me boring if you must, but I think it is more boring if the only thing you can do for dun is sit in some dreary bar drinking beer after beer. Leave the going out to the younger coworkers who can still handle the late nights! The last thing I want to do is to go to a bar with coworkers in their twenties who I sure can’t keep up with. I much prefer to keep to one drink and a quiet evening, even on the weekends. I definitely don’t want to stand out as the random old person in the group!!! I am grateful I learned this one very early in life. I wouldn’t have gotten as far in my career if I spent every evening going out, wasting money and getting to work tired in the AM. Sometimes you can’t tell people what they should do. They have to learn for themselves, and sometimes that means losing a job. A tough lesson that you hope will sink in. Sports bars aren’t always full of guys getting drunk or staying out late. We’re there to watch some games on TV and discuss the teams, argue about the plays, etc. My group enjoys a few rounds of beers, pizza and a sensible night out. I’m a morning person. I get up 5AM even on the weekends, so going out late was never even an option because I’d be too exhausted. So many people have commented on this subject. It’s got to be something of concern. I wonder if any of the interested parties, no pun intended, have thought about just saying NO to the work night partying. Confine it to the weekends, and everything in moderation. I read what Zena said. When I left my hometown & took a job in Utah I was feeling out of place. It was hard to make new friends at work. Most of the people there were married with children. So I joined a gym and I volunteer one night a week at the hospital. I’m getting to know a lot of people my age. You need to wait a while before you can have a group of like-minded friends from work. Take your time to get to know them. Be friendly, say hello and smile. Check with your HR office to see if your company has any activities you might want to join. I’m a little shy. English is not my first language. Someone at work made me feel welcome and introduced me to several women who like to socialize outside of work. We go to museums, movies and once in a while just get together over coffee at a diner. No bar scenes. Maybe it’s the generation – gap thing. When I was 23 I was already married and didn’t have a dime to go spend with my buddies at a bar. There was rent, etc. and a baby on the way. Now people are staying single way too long. Every so often it is nice to let loose, but you need to know your limit. Cut yourself off before things get out of hand and don’t go out every night. You still need to function at work. My other rule of thumb is that I do not go out drinking with coworkers. I keep my personal life very separate. I don’t think it is wise to let people you see in a professional setting also see you drunk…especially if you oversee them. I’ll have one drink, show my face and head right back home the two or three times I go out with coworkers all year. The last event I went to proved why you should be cautious of this. The whole department wound up getting completely trashed, including the new manager. It completely changed my opinion of him and now his whole team has that to hold against him. You really have to be cautious because you can ruin your reputation in just one evening. My husband is addicted to his phone and stays up until 2 or 3 am getting the sports scores from games out west, the latest news and stock reports, etc. Then he’s tired all day and naps in the office. I catch him because I’m his office manager/business partner. The thing I find funny is that some of my employees will call out sick, but you see photos all over their social media of drinking at night. A little suspect! We have summer interns in my office. This usually becomes a problem in the beginning because they are young and new to the corporate world. Eventually they catch on and calm down with the going out. We make sure out fulltime employees set a good example for them too and don’t intermingle. Timely subject, with certain pro athletes’ questionable behavior during their free time effecting their performance on the field. Your job is priority one. My job in finance is very stressful and I need to hang out with my friends when I leave work. But we do it once a week, on Thursday. We all know enough not to go overboard or we might lose our jobs if we can’t make it in on Friday, the busiest day for my company. Right with you Sue. My boyfriend is way too into fantasy sports nad stays up late and dedicates so much energy to it. Wonders why he has no energy left in the morning when he should be awake for work……….. I hear what Debbie is saying about a reputation getting ruined. Unfortunately my job depends on my socializing with prospective clients over lunch and after hours. And I’ve had to learn a number of ways to turn down drinks-without insulting the client who is having quite a few, or a few too many. It’s so hard to truly strike a balance between work and having a personal life. I had to chime in about after work socializing. It’s the only time I get to have with my co-workers when we can be ourselves and get to know each other. I say go out, but don’t go crazy! This has generated a lot of responses for balance and moderation. Maybe it’s an age thing, that so many people are having a hard time maintaining that necessary balance. I’m a little older and wiser now and have no trouble turning down the after work invitation to party hearty. Having a life? What is that haha As a workaholic I appreciate this article–it’s a great reminder to slow down every once in a while. Balance is key! It’s funny but I have the opposite take on this. I just moved to Salt Lake City and the night life is pretty dull. Most of my co-workers are married & rushing to get home after work-not to socialize. You have to have that delicate balance of ME and WORK. If WORK becomes all of ME then i’m an unhappy person and the rest of the world knows it. The key is always balance. Work can be great if you realize why you’re doing it and if you have time to regularly do what you want outside of your work. I think it’s ok to go out on weekdays, but personally, I’ve always believed in relaxation and allowing your brain some form of COMPLETE REST before you start a new day. Honestly, it’s doable but you have to be smart about how you manage your time. Previous post: How do Business Cards Promote You? Next post: 10th Annual Create a Greeting Card Scholarship Contest – Round 9 Winners Announced!